John Kurrpurra Tjakamarra was one of the original artists painting in Papunya at the start of the Aboriginal art movement. His early paintings were similar to traditional sand mosaics. These sand mosaics were instrumental in the preparation of a corroboree site. His designs were simple but powerful. His later paintings were full of color and based on stories and designs of the Tingari ceremony. 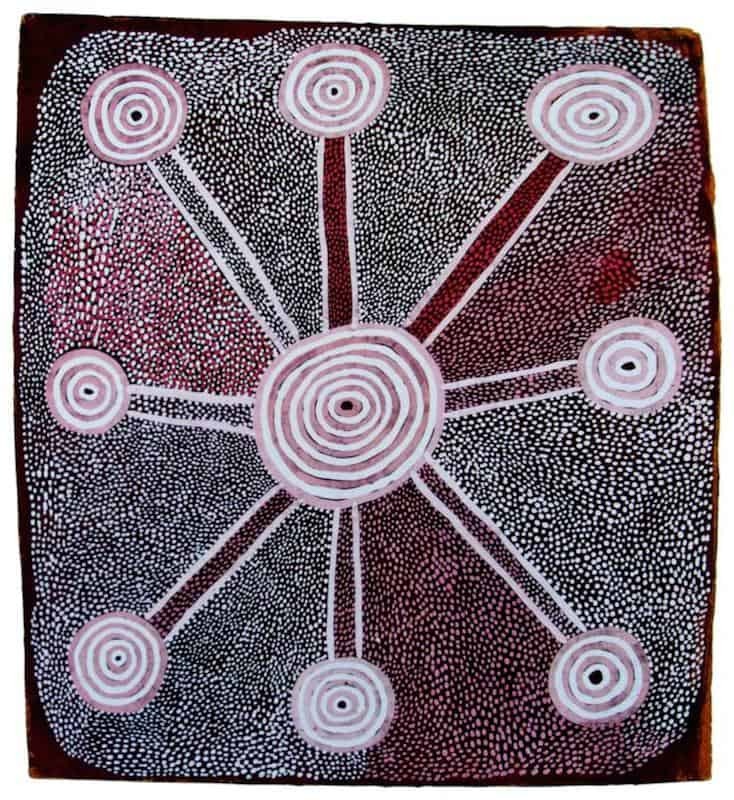 In the early part of his career, John Kurrpurra Tjakamarra painted on small bits of board in ochred colors. His later works are on medium sized canvasses and colorful. Some of his early works are ritual and contain secret imagery meant only for the eyes of initiated men. The aim of this article is to assist readers in identifying if their Aboriginal painting is by Kurrpurra Tjakamarra. It compares examples of his work. It also gives some background to the life of this fascinating artist. 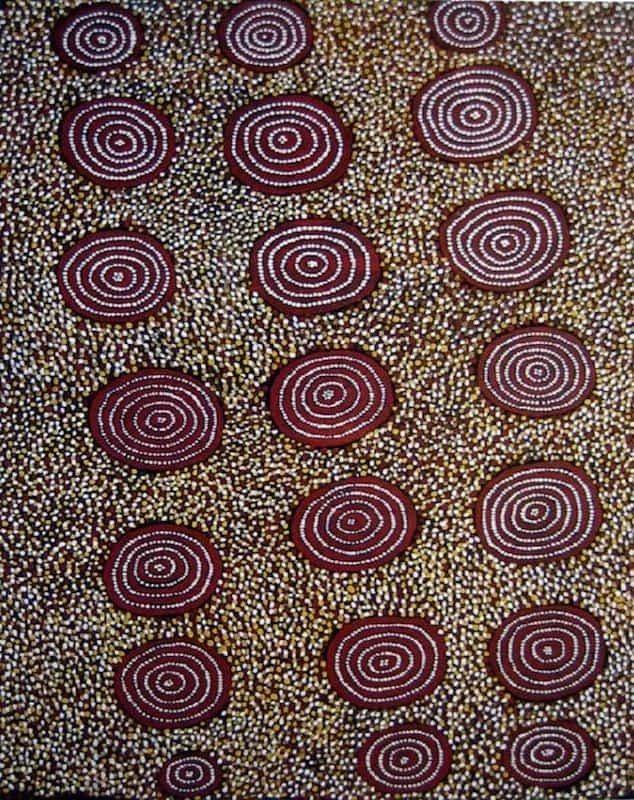 If you have a John Kurrpurra Tjakamarra Aboriginal painting to sell please contact me. 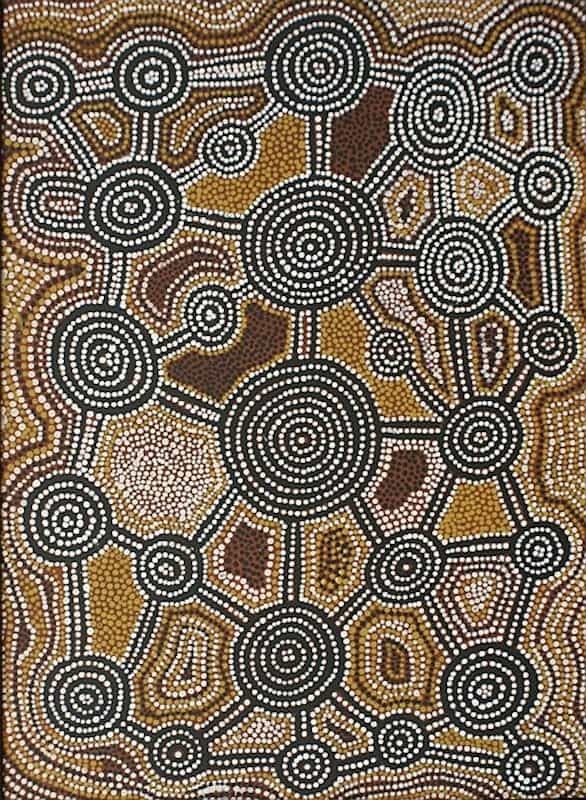 If you want to know what your John Kurrpurra Tjakamarra painting is worth please feel free to send me a Jpeg. I would love to see it. John Kurrpurra Tjakamarra was born near Kulkuta west of Tjukurla. He was fully initiated and lived around Kulkuta before moving to the salt lake country southwest of Lake Macdonald. John encountered Europeans for the first time in his early 30’s. He and his family decided to re-settled at Papunya in the early sixties. In Papunya, John Kurrpurra Tjakamarra worked with Anatjari, Yala Yala and Tjukurti as a farm laborer. In 1971 Geoff Bardon became a local school teacher at Papunya primary school. He tried to encourage local children to paint in their sale. traditional style. When he found out only older men could paint these stories he started a men’s painting group. 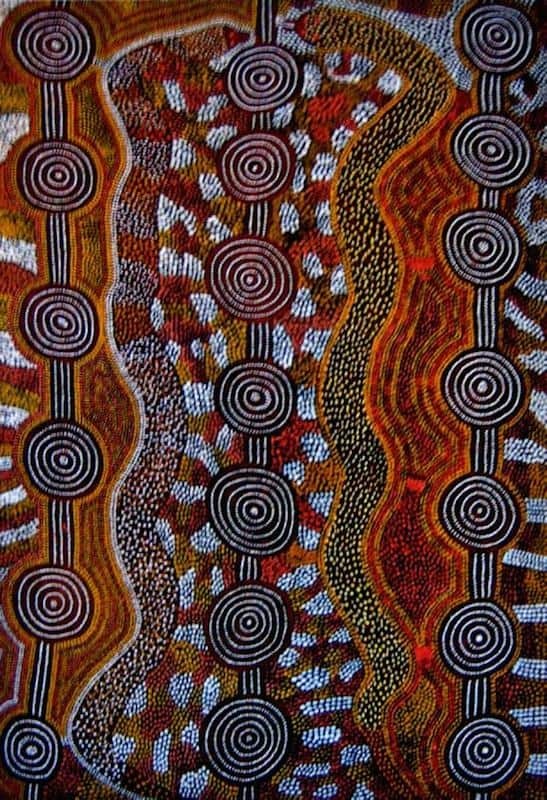 John Kurrpurra Tjakamarra joined this group of emerging painters. He painted on composite board while sitting with the board on his knees. He always used earthy ochre tones similar to those found in his home country. His paintings were simple yet powerful in their composition. In many of his early paintings, he depicted five-circle grids linked by traveling lines from concentric circle to circle. This design was similar to traditional sand mosaics. 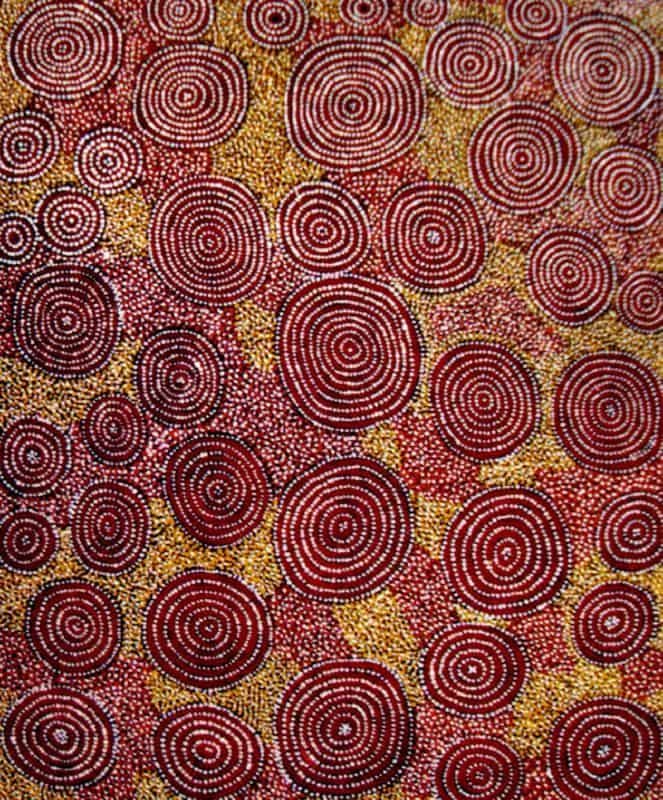 Sand mosaics designs were for use during corroborees and are spiritual in nature. His early paintings reflected the life force and spiritual essence he associated with his homeland area of Kulkuta. Kurrpurra Tjakamarra middle period works often embraced the stories and designs of the Tingari ceremony and ancestors. The mythical travels and actions of the Tingari men and women were less culturally sensitive. As a subject matter for saleable art were more suitable than those of a secret and sacred nature. As Kurrpurra became more commercial he turned away from ochred tones and adopted vibrant color. In 1972 he was one of four Pintupi men who assisted an Italian crew to make a film that dealt with the last traditional hunter-gatherers on earth. He was a lithe, handsome man at the time and unmatched at reading the tracks of animals. 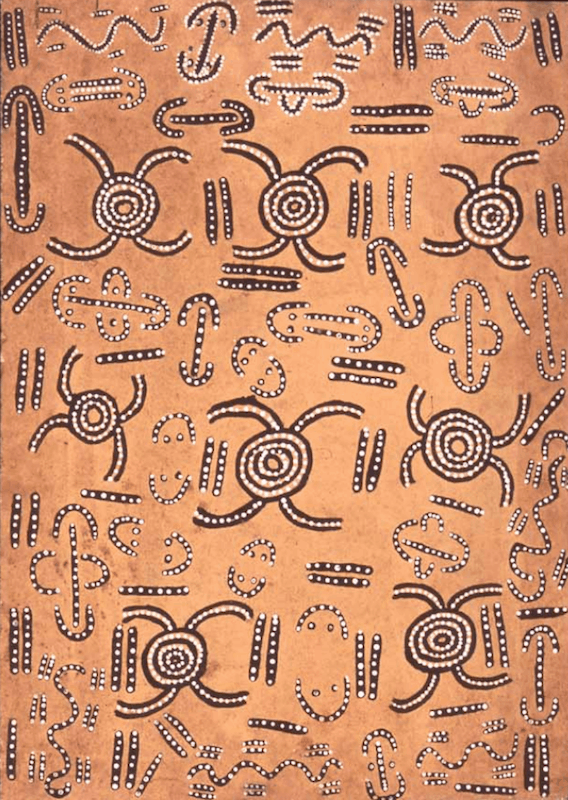 During the seventies, as the Papunya painting movement gathered momentum, John lived and worked at Yayayi. Yayayi was a small outstation 40 kilometers from Papunya. Peter Fannin would drive out to Yayayi to deliver supplies and pick up pieces of art for sale. In June 1974 Kurrpurra Tjakamarra traveled back to Kulkuta and Yawalyurru with a group of men. It was the first of several trips made with the intent of establishing a community there. In 1981 John Kurrpurra Tjakamarra leads 300 men, women and children back to their Pintupi homelands to establish the community of Kintore. The same year one of his joint artworks with Freddy West was included in Australian Perspecta. This was an important moment in the legitimization of Western Desert painting by the art establishment. It caused international interest and became a catalyst for a re-appraisal of the identity of Australian art. After his move to Kintore, Kurrpurra Tjakamarra painted fewer and fewer works. These works although very colorful lack the meaning of his earlier works. They are not highly regarded by collectors. He continued to hunt and track until well into his 60’s. John Kurrpurra Tjakamarra spent the remainder of his life at his small outstation Walungurru. He died in 2002 at the age of seventy-two. Kurrpurra Tjakamarra can also be spelled Kurrpurra Jakamarra, Kurrpurra Djakamarra or Kurrpurra Jagamara.